UK shoppers overspend by £1,274 a year thanks to confusing in store promotions. Ever got home from a trip to the supermarket and wondered just why you’d ended up with several boxes of cereal when you only wanted one? Well you’re not alone, according to the Money Advice Service, which asked 2,000 (rather confused) consumers to select the best value deals from four sets of offers. The independent body set up by the government found just 2% of people managed to get them all right. The lure of special offers can get us all on a bad day – you might not need any lemons, but that buy one get one free screams fantastic deal; how can you refuse? This has whipped up the predictable flurry of headlines and it’ll likely bring about more calls to make special offers easier to navigate for customers. Though really, the information is there. 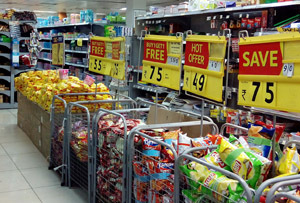 Supermarkets might point out that customers should simply do the math. But no-one wants to have to their calculators out just t do the shopping. It' not the first time the issue has been raised. A Competition and Markets Authority investigation back in July, found evidence that supermarkets were misleading customers with confusing pricing promotions. The latest survey could well place the supermarkets under yet more scrutiny. And being forced to scale back could be a further blow to the likes of Morrisons and Asda, as retailers often get discounts in exchange for the promotions. The odd shopper getting a bit savvier won't be much to worry about, but a blanket change could be a problem. Tesco though has been giving some promotions the chop recently in an effort to focus on offering cheap prices across the board. That's been driven, as has become a pattern recently, by Aldi and Lidl's ongoing supermarket sweep. Mind you, there might be something in the fact that the barnstorming German discounters use simpler pricing systems than many of the supermarket stalwarts. The nation’s weary shoppers simply don't want to spend 10 minutes assessing whether a 910g bottle of ketchup for £2.49 would be a better value purchase than a 460g bottle on offer at £1.50. The survey did point out much of the pain could be avoided if only we stuck to a good old shopping list though. Those who wrote one (and stuck to it) spent on average £217 less a year than those who don’t bother. Think of all the extra ketchup you could buy with that.